Contra Corner » Clueless Jack Lew Says Stimulus Worked, All Is Awesome…….Really? Clueless Jack Lew Says Stimulus Worked, All Is Awesome.......Really? The last time I had occasion to notice Jack Lew was last January when he was in Davos assuring the world there was nothing wrong with either its economy or markets. He even went so far as to reiterate the “official” Treasury position about the dollar. He didn’t say it explicitly, but his meaning, much to do with the timing, was clear. The “strong dollar” was affirmation of all that was supposedly right at that moment of seemingly clear sailing apart from “transitory” oil prices. The strong dollar, as all my predecessors have joined me in saying, is a good thing. It’s good for America. If it’s the result of a strong economy, it’s good for the U.S., it’s good for the world. A little over a year later, there’s no more of that. Lacking consistency as usual, politician after all, Lew spoke at the G-20 meeting suggesting now that the economy once confirmed by the “strong dollar” still exists – and that it is “markets” that are now all wrong. The dollar was a “market” in early 2015 which he suggested had it all right; now that is no longer believed widely, markets are now apparently wrong. The fact that he doesn’t explicitly state which one he is referring to is indicative of this kind of short-termism; undoubtedly he is suggesting the stock market as the bright flashing change this year to last (in other words, the dollar remains but it has been stocks that have gone over to the “dark side”). In that case, he would have done much better using actual market data from his own fiefdom – US treasuries. 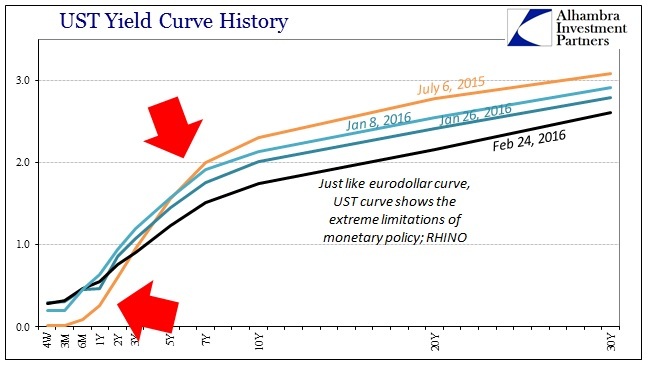 The treasury curve has been sinking since November 20, 2013, so it wasn’t like there was some sudden suggestion in January 2015 that “markets” were not uniformly behind him. In fact, at that point only stocks seemed unbothered by the increasing and intensifying “market” turmoil all over the place; not just in the utterly bearish flattening UST curve or the conspicuous crash in oil prices, but eurodollars, foreign currencies and all the areas that actually matter economically-speaking. 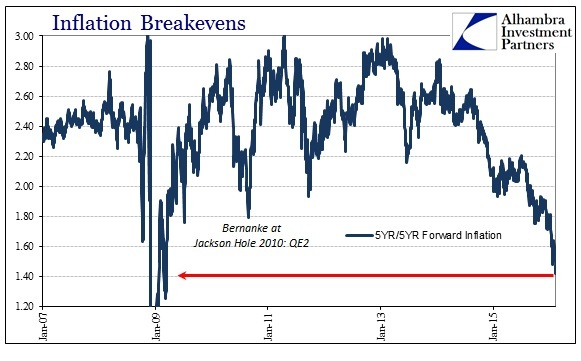 We should also include another “market” under Treasury, TIPS, and their own downright alarming inflation expectations. The “rising dollar” that began in late June 2014 was a warning, one that has so far been proven correct at the direct expense of all those like Secretary Lew emphatically suggesting the world discard all those observations in favor of nothing but his own (and Yellen’s). It’s not just he has been wrong (really wrong) over the past year, it’s also about what he is suggesting everyone will do about the thing that isn’t concerning. “We will urge greater use of policy space, including fiscal space, to bolster global demand. That would lead to strengthened confidence and I would suspect reduce volatility,” the Treasury official said in a preview call with reporters ahead of a G20 meeting later this week in Shanghai, China. When he says “we” again it isn’t clear through which capacity he is speaking, either as a representative of the US government or one of the G-20. In the end, however, it doesn’t really matter since it is all based on processes and policies already proven ineffective. Last week was the seventh anniversary of the ARRA or “stimulus” bill; judging by the lack of enthusiasm for even acknowledging it, let alone widespread celebrations of its purported successes, it has been forgotten for good reason. I don’t think there’s a secret as to why the US economy is doing well. Obviously, it starts with a very resilient people, a very resilient economy. But it also started with policy and we took definitive steps, at the beginning in 2008, to staunch a financial crisis. We took more steps than most of the rest of the world did. We took very decisive steps to get demand growing again in this economy and we’re now reaping the benefits of that. The “benefits” were staring him right in the face at that exact moment, as the liquidation processes that would lead only a week later to the “buying panic” (again in his own jurisdiction) of October 15, 2014, that was much, much more than the most visible action in UST collateral. As Treasury Secretary, Jack Lew seems curiously to take no account at all of treasury “markets.” In other words, “markets” were already rejecting that very interpretation about the US and global economy. 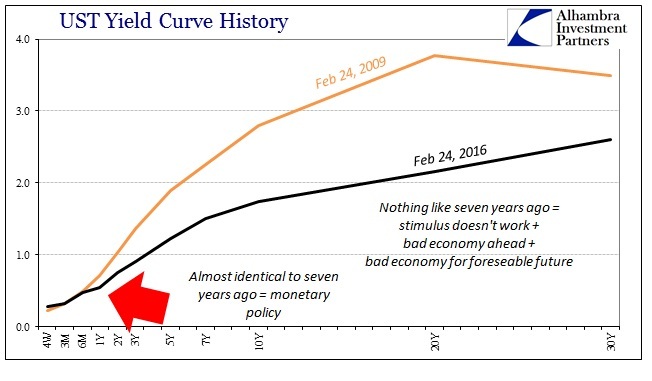 Since October 2014, the world has become uniformly more the turmoil predicted by those “markets” and less and less like the fantasy world of ARRA and “stimulus”; the “reaping” has been just that one-sided. I suppose if the distance between these bouts of actual awareness is long enough, we could sadly be in for interchangeable failures of different pieces of statist intervention. We started with Keynesian government “stimulus” that relented to purely monetary “stimulus” and now seem to be heading back toward government spending once more. Once that inevitably fails, “they” will probably resurrect “Friedman” to replace “Keynes”, this time with the “right amount” of monetarism (rereading Chapter 11 in A Monetary History probably). And so it will go back and forth with nary a reference to the actual economy until the entire globe is encompassed in fullblown Japanification for a quarter century or more (which would be a depressing and desolate future, especially as past history surrounding desperate economic times almost always ends in significant conflagration – political history is really economic history without all the math). And “capitalism” will be blamed the entire time. Monetarism is not distinct from Keynesianism at all, in fact the DSGE models that guide the Fed toward ineffectiveness are all neo-Keynesian. Those two seemingly separate philosophies aren’t; they are just different methods of a common root. As you can appreciate from Secretary Lew’s most recent comments, capitalism now involves no market judgments at all, which is perfectly Keynes. We have reached just that sort of Orwellian crossroads, where markets that scream not just recession but potentially a really bad one, are irrelevant, and in their place are the beacons of economic freedom in the persons of Jack Lew and Janet Yellen. At least there is some consistency here on “their” part, namely that they view both “jobs saved” and the unemployment rate as being highly indicative and significant in this continued recovery that markets no longer see or believe. Since the unemployment rate really doesn’t tell us much about “jobs created” in this cycle, it might be better termed the Jobs Saved Index for the Jobs Saved Recovery. Until politics puts an end to the madness of repeated failure, our future better be shovel ready.